We’d love your help. Let us know what’s wrong with this preview of Echoes by L.A. Ashton. Being undead hasn't stopped Aran from living life to the fullest. He has all the money and power his charm a After one thousand years of listless eternity, Oskar is used to his particular brand of loneliness. But a long walk through middle America and a few chance encounters will lead him straight to a man he'd known to be long since dead―his childhood best friend, Aranck. Being undead hasn't stopped Aran from living life to the fullest. He has all the money and power his charm and business savvy could earn him, and plenty of friends. Lately, though, something seems to be missing. After a millennium, perhaps the world's shine has worn off—and that's when Oskar stumbles back into his life, reminding him of who he used to be. To ask other readers questions about Echoes, please sign up. talk about the longest slow burn to ever slow burn holy hell.. if you’re looking for a book with pining that lasts a MILLENNIA than this IS THE BOOK FOR YOU!!!!! But before I knew it I was invested. The more... intimate scene towards the end somewhat continued unexpectedly long but it didn't take away from the story, which was exceptional. I don't even like vampire and werewolf stories but if they were all like this I could love them. It's been a long time since my last review. I just fell in love this story, it is a slow burn romance. The way the feelings are described is just amazing. Feel connected to the characters. Very well developed. To me a MUST READ! If you like lgbtq fiction, romance, and the slowest slow burn to ever burn this book is for you! I've been trying to get my friends to read Ashton's writing for YEARS. I'm excited to have a hard copy I can push into their hands in addition to opening tons of archive tabs on their phone. Just as with Valhalla, this author blew me away After reading and reviewing L. A. Ashton’s Valhalla, released from NineStar Press back in December 2018, I practically tripped over my own two readerly feet to get my hands on this author’s full-length novel, Echoes. I preordered it and it sat taunting me in my Kindle until I bit the proverbial bullet and just made time to read. Did I have it to spare on this particular weekend? Nope. Do I care one iota that I lost sleep to read it? Heck to the no. What a fantastic read! The story sucked me right in from the start. I absolutely loved the suspense of the story; I kept wanting to read more so I could find out who was the culprit! More than that, the cast of characters was so interesting and Oskar and Aranck will forever have a special place in my heart. The slow burn of their romance was almost frustrating at times, but it was really rewarding in the end! The world-building in itself was really intriguing as well. Not only the way that vampi What a fantastic read! The story sucked me right in from the start. I absolutely loved the suspense of the story; I kept wanting to read more so I could find out who was the culprit! More than that, the cast of characters was so interesting and Oskar and Aranck will forever have a special place in my heart. The slow burn of their romance was almost frustrating at times, but it was really rewarding in the end! From that review: It's rare that a story with vampires and werewolves can offer up a new narrative slant on both but Echoes by L.A. Aston does, and with a story full of jaw dropping, mind spinning, never saw that coming stunning twists. Do I love this story? Why yes I do! "A thousand years weren't enough to forget him." I thought this was an enjoyable story with some excellent world building. The story focuses on a vampire attack against some werewolves and the local vampire district leader has to do his best to find out what happened and who was behind the attack. As he investigates he comes face-to-face with his past, but it is a past but he never would have thought possible. The story is really about the politics between within the vampire community and between the vampires and the wolves. It is an exciting story with rich characterisation and it definitely drew me in and held my attention. I really wanted to know what had happened and how the mystery would be resolved. The answer wasn't obvious so I was nicely surprised at the end. I enjoyed the relationship between the main characters particularly as they were attracted to each other but that wasn't immediately obvious. Their relationship was slow burning. Overall I thought this was a good book to read. It is the first time I have read anything from this author and I will definitely read her books again. My only criticism of this story is that it sometimes felt a bit too slow and I think maybe this might be the first story in a series. It definitely felt like a introduction to a series. Oskar is a wandering vampire. He's lived a thousand years, since the Vikings. When he shows up in the middle of corn field flat Iowa, he's overcome with emotion to see his best friend from his human life. Aranck has made something of himself as the 'Lord' of the vampires in his town. He's charged with dealing with all There were quite a few twists and turns in this story that I was seriously unable to stop reading to the end. So dramatic, fantastic and the longest pining in the history of pinings. Aranck has made something of himself as the 'Lord' of the vampires in his town. He's charged with dealing with all matters of bloodsuckers as well as keeping the peace with the were wolves in the area. When there's a matter to be dealt with the truce between the two is compromised. But to what end? "The fragility of humans is strange. Creeps me out." I don't want to give anything away, but this was a serious edge of your seat entertainer full of blood lust, shifters and secret promises you won't want to put down. 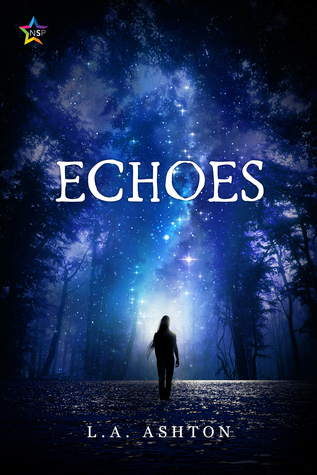 I received a copy of Echoes by L.A. Ashton via IndiGo Marketing & Design in exchange for an honest review. I am always intrigued by an author who can add a new twist to the vampire mythos. The author has done that in Echoes. The idea that two humans were both turned a thousand years ago finding each other again lends itself to some interesting scenarios. The contrast between what they’ve each become in the intervening centuries provided much of the angst in the story. There are also several I received a copy of Echoes by L.A. Ashton via IndiGo Marketing & Design in exchange for an honest review. I am always intrigued by an author who can add a new twist to the vampire mythos. The author has done that in Echoes. The idea that two humans were both turned a thousand years ago finding each other again lends itself to some interesting scenarios. The contrast between what they’ve each become in the intervening centuries provided much of the angst in the story. There are also several morally ambiguous characters, which did not bother me except in one case. The setting in the cornfields of Iowa contrasts with the urbanity of many of the vampires in the book. A worthwhile read. I've had an ARC of this for a while, and had meant to review a month ago, but I just didn't have time. I haven't read a novel in over a month, but tonight, I finally had time. I read the whole book in one sitting. See my full review here: https://saracoda I've had an ARC of this for a while, and had meant to review a month ago, but I just didn't have time. I haven't read a novel in over a month, but tonight, I finally had time. I read the whole book in one sitting. A very good novel, with interesting characters and an engaging plot. I liked the way the writer describe the character's feeling and how the plot is developed. It's a very good urban fantasy with a romantic twist and some spiritual side. A unique paranormal vampire romance that’s definitely worth a read. I could read so many more novels with this romantic premise. I LOVED Aranack, the languages & reading about vamps of color and interracial relationships!! The mythos and hierarchy reminded me of that in the Southern Vampire Mysteries which is definitely a good thing. Some decent slow burn romance with an alright pay off. You could tell there was an attempt at realism in the intimacy portion but it came off a bit unrealistic unfortunately. Ending felt a little odd and fizzled somewhat. Felt like an attempt at open ended/continuation point. While most of the common tropes found in vampire novels are present, it does give everything an interesting twist. Some of the twists were quite unexpected and I always appreciate when a book manages to surprise me without ever needing to lie. I enjoyed the characters, though it would have been nice to have a little more backstory it's understandable why there isn't. It's not needed, it would just be nice. All in all very enjoyable.